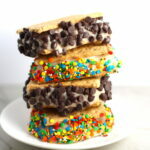 Banana Ice Cream Sandwiches with Graham Crackers are a healthier delicious frozen treat for the last few days of Summer and even into the Fall! Banana Ice Cream is literally just 2 ingredients, Frozen Bananas and Almond Milk. 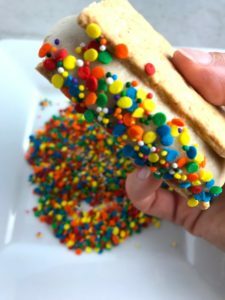 Add in crunchy Graham Crackers as the 3rd ingredient and you have a delicious healthy Banana Ice Cream Sandwich! 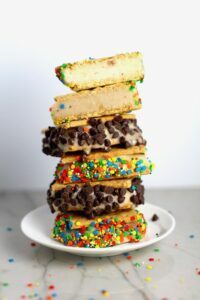 Ok, Sprinkles are an extra ingredient, but absolutely not necessary for this delicious ice cream sandwich! 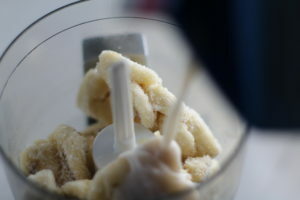 If you havn’t tried banana ice cream, you are in for a treat! 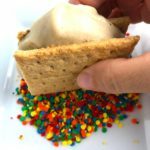 It tastes just like soft serve ice cream and comes together in seconds in a food processor or blender. This Banana Ice Cream literally has only 2 ingredients: Frozen Bananas and Almond Milk. 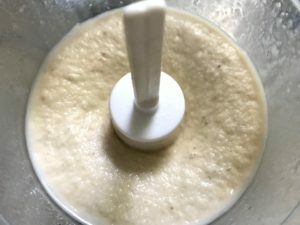 My younger daughter is dairy free, so I used Almond Milk, but you can use any milk you have in your house. To prep ahead, you do need to slice and freeze the bananas, but that’s really it. This is easiest to do the night before you make them, but in a pinch, they can usually freeze in just a few hours. I like to buy lots of bananas…some we can peel and eat and others that I let get really ripened and then slice and freeze for smoothies and this ice cream. Tip: When you slice the bananas, put them into a plastic freezer bag and then slide the slices around into a single layer. This prevents the slices from sticking together in a big clump and allows them to blend up much easier in the blender or food processor. 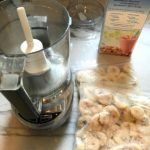 Once the banana slices are frozen, add 2 cups frozen banana slices to a food processor or blender with 1/2 cup Almond milk (or any milk you have on hand). Pulse to get the blending started and once you see it starting to come together you can just blend. If it is still way too thick and not really blending smooth, you can add another tablespoon of milk but be careful not to add too much liquid as you want it to be thick like soft serve ice cream. 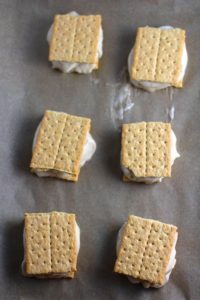 Next, break your graham crackers in half so that you have 2 rectangle pieces per sandwich ‘slice’. Place one graham ‘slice’ down on a sheet pan. TIP: I like to cover the sheet pan with parchment so that the sandwiches are less likely to stick and it’s easy clean up for me. 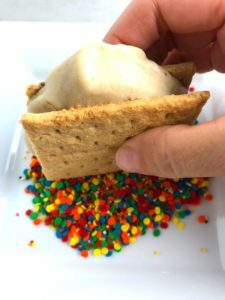 Add a scoop of banana ice cream to the graham cracker bottom, then top with the second graham ‘slice’. Now comes the optional part…SPRINKLES! My little puts sprinkles on everything…pancakes, waffles, ice cream, cupcakes, cookies… My older one loves mini chocolate chips. Really its up to you what you prefer to add – or add nothing at all! 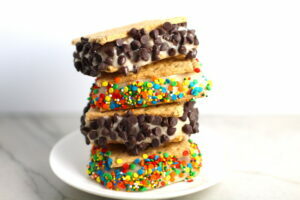 You could even dip these into hot fudge!!! Banana Ice Cream is literally just 2 ingredients, Frozen Bananas and Almond Milk. 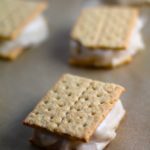 Add in crunchy Graham Crackers as the 3rd ingredient and you have a delicious healthy Banana Ice Cream Sandwich! 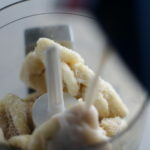 If you have never tried banana ice cream, you are in for a treat! It tastes just like soft serve ice cream. Freeze Bananas: Peel and slice the bananas, put them into a plastic freezer bag and then slide the slices around into a single layer. This prevents the slices from sticking together in a big clump and allows them to blend up much easier in the blender or food processor. They need probably 4 hours, but easiest to freeze them overnight. 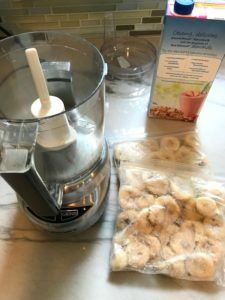 Once the banana slices are frozen, add 2 cups frozen banana slices to your food processor or blender with 1/2 cup Almond milk (or any milk you have on hand). Pulse to get the blending started and once you see it starting to come together you can just blend. If it is still way too thick and not really blending smooth, you can add another tablespoon of milk but be careful not to add too much liquid as you want it to be thick like soft serve ice cream. 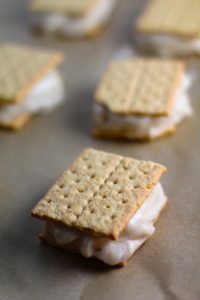 Break your graham cracker sheets in half so that you have 2 rectangle pieces per sandwich ‘slice’. Place one graham ‘slice’ down on a sheet pan. 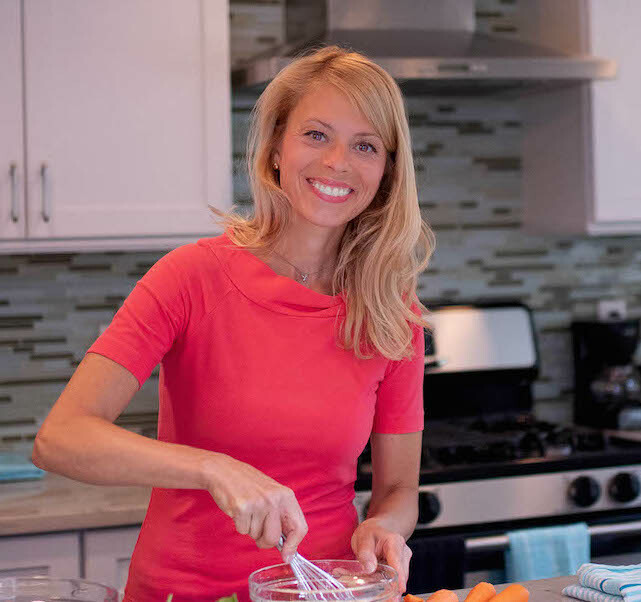 TIP: I like to cover the sheet pan with parchment so that the sandwiches are less likely to stick and it’s easy clean up for me. 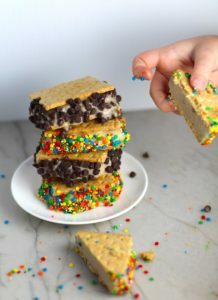 Add a scoop of banana ice cream to the graham cracker bottom, then top with the second graham ‘slice’. Optional Step: Roll in sprinkles or mini chocolate chips.